“Surfing someone’s iPod is not merely a revelation of character but a means to a rich personal narrative, navigated by click wheel.” (Newsweek, October 23, 2006) — an excerpt from Levy’s book called The Perfect Thing. One thing I notice: not too many female artists on that list and I realize that I don’t have too many on my player, although I have quite a few rocking women groups and solo artists in my collection. As part of the ongoing SixWordStory project I have launched with the tech folks in the National Writing Project network, I got inspired to create a Found Poem that uses all of the words posted so far in the Wiki adventure. Are you curious about what I found? Head to the Found Poem and/or listen to me read the poem. This was originally posted to a new project I am starting called Youth Radio that seeks to connect upper elementary/middle school students via audiocasts. Students in Southampton, Massachusetts, have been working on creating Peace Posters. The project is supported by the local Lion’s Club as a way to foster understanding of peace in the world through artistic expression. Sixth Grader Kathryn takes you on an audio tour of the art classroom, asking these young people to explain the themes and symbols in their posters. Listen in as the students think about the meaning of a peaceful world. Wesley Fryer (one of those folks whose Moving at the Speed of Creativity blog should be securely fastened into everyone’s RSS Aggregator) just posted a great article that builds upon the concept of digital natives/digital immigrants (as put forth by Marc Prensky). His idea is that there are more than two layers of people and their comfort level with technology. 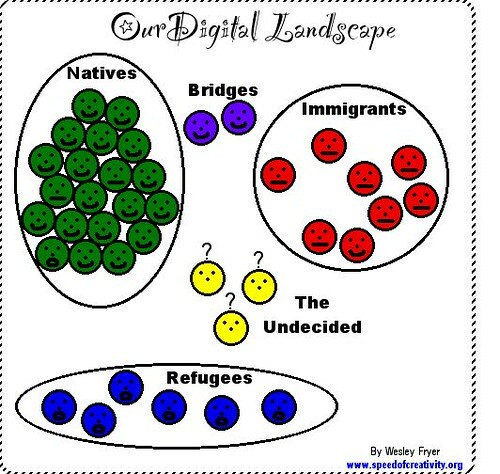 Fryer suggests that the world might be split into Natives (young people fully immersed from birth into tech); Immigrants (those who are finding their way into tech possibilities); Refugees (those who see tech and don’t want to touch the start button); Bridges (the sort-of undecided about whether tech is good or bad, but keep a toe in the door); and the Undecided (really perplexed about tech). The NWP Six Word Story Wiki site is gaining momentum in the last few days. I just learned that I have been awarded the Exellence in Teaching Award from the New England Association of Teachers of English and I could not be happier. I have presented at a few NEATE conferences (blogging, digital claymation, etc) and written a few stories and articles for NEATE publications. The letter I received gave me some kudos and for me, the award really supports the idea of an intergrated, creative/critical-thinking based writing program for sixth graders, and so I am deeply appreciative. “Kevin, your teaching is a testament to your passion for innovation and engagement with your profession. Not only do you hold a highly professional ehtic but also you round your teaching to reach and affect students and colleagues alike. The breadth of your skill, knowledge and mastery of your profession is impressive.” — David O., NEATE Award Chairman, in his letter to me. Wow! Those are very inspiring words to a teacher in the classroom and makes me all the more dedicated to my students and to others around me. PS — This award falls on the heels of two NWP colleagues getting recognized for their work, too. Maria Angala of Washington DC won an award for her work for weblogging and Dave Boardman of Maine just won a co-technology teacher of the year award for the state of Maine. So I feel as if I am good company. In the recent Time magazine, there is a very funny back-section feature by Evan Eisenberg that pokes fun at the idea of a Google-Universe (it all started with the Big Search) by offering up possible future Google products. Blobber — Impose your consciousness on the rest of humanity — it’s easy, fast and free! You can access the real article here. Then I got to thinking, the technology liaisons in the National Writing Project are writers by nature and, although pressed for time, they might be able to pull together six words and create a short story. So I launched a Wiki, sent out e-invites, added a video welcome, and began mapping (with CommunityWalk) where the writers live in the world. And I am urging them to record an audio version of their six word stories, either as an MP3 or through Vaestro. It’s been very interesting. Title: The End of the Affair (a short romance by Scott, KMWP) Listserv message. Lover hit “reply.” Ooops! I recorded and posted an audio version of my first story. I was moving through some links provided by a friend, Glen B., from Oregon (who is developing some great online lessons around digital storytelling, podcasting and other Read/Write applications) and one of his links took me to a great site that archives some old radio programs from the Golden Days of Radio. It reminded me of one of the very first vinyl records I ever received — a copy of a Flash Gordon radio show and I used to listen to the hiss of the show in the darkness of my room, transported to the planets which Flash is exploring. What was wonderful is that it gave me an opportunity to have my young sons listen to the Abbott and Costello skit about Who’s On First — they had heard of it but never heard the actual bit. Want to find all the old archives? Remember Buck Rogers? Flash Gordon? Well, I really don’t but I like to listen to some of the old voices. One reading pleasure that I get is when I open up the New Yorker magazine and there, in the table of contents, I see the byline: Malcolm Gladwell. The author of Blink and Tipping Point (both of which were built from articles in the magazine, I believe) writes with such clarity and insight about a wide variety of issues, it becomes like a little journey of the mind to follow where he is leading you. In last week’s New Yorker, Malcolm is on the trail of software that can be used to predict the success or failure of movies. It all has to do with indentifying attributes, categorizing them in certain ways and then letting the computer analyze the structure of movies. Some movie companies are now channeling movie scripts through the computer program and pressuring for changes before the actors are even hired. There is something sterile about that process, I think, but that is another post. What I was interested in was almost an aside in the article: the use of software to help musicians and producers analyze music, using mathematical formulas based upon beat, harmony, pitch, chord progression and cadence. The software called “Platinum Blue” can pick “whether a song is likely to become a hit with eighty-percent accuracy,” according to Malcolm. The creator of the software is not interested in the songs, per se. “He cared only about a song’s underlying mathematical structure,” according to Malcolm. This is all very interesting but then the creator of the software comments: “We think we’ve figured out how the brain works regarding musical taste.” I wonder how that can be? And if true, does this mean that we are moving towards some uniform musical taste analysis? Interesting.